On this page we are assembling materials that may be useful for designing curriculum around cacao and its derivative, chocolate, topics of note in the ethnobiology of Mesoamerica. (Theombroma cacao) The earliest physical evidence of the presence of cacao in Mesoamerica dates as far back as 2000 years B.C.E. and comes from the Olmec culture of Mesoamerica (Mexico, Belize, Honduras, and El Salvador). Having percolated through the subsequent Maya and Aztec cultures, cacao and chocolate eventually became known to the Spanish colonizers. Though most early accounts of the cacao tree come from colonial-era European records, there exists an abundance of indigenous art and legend demonstrating that cacao was one of the most sacred natural staples, with ritual, economic, and dietary value prior to contact. 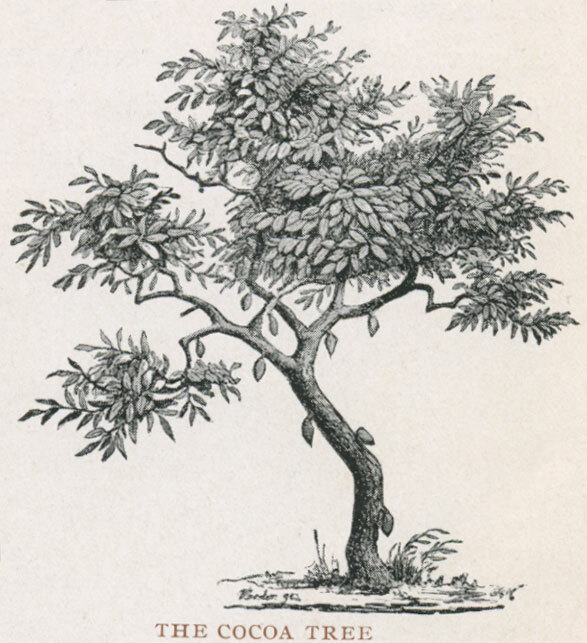 Although botanical evidence suggests the cacao tree is native to South America, it was the Mesoamerican civilizations (Olmec, Maya, Aztec, etc.) who popularized it and held it in the greatest esteem. (Dreiss-Greenhill 4) By the Classic Period, in Maya settlements, it had become especially prevalent. 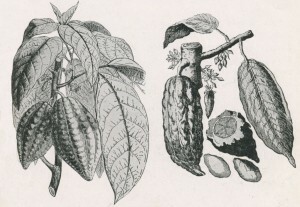 Carl Linnaeus, who pioneered the system of Latin scientific nomenclature, named the cacao tree “Theobroma cacao” which translates to, “Food of the Gods: Cacao.” (Dreiss-Greenhill 4) Here is a beautiful botanical image of cacao hosted at Dumbarton Oaks research library in Washington, D.C. Very recent linguistic research finds Nahuatl origins for the term chocolate (chocolatl, xocolatl) to be problematic. Examples of the use of “chocolatl” in early manuscripts are also extremely rare. 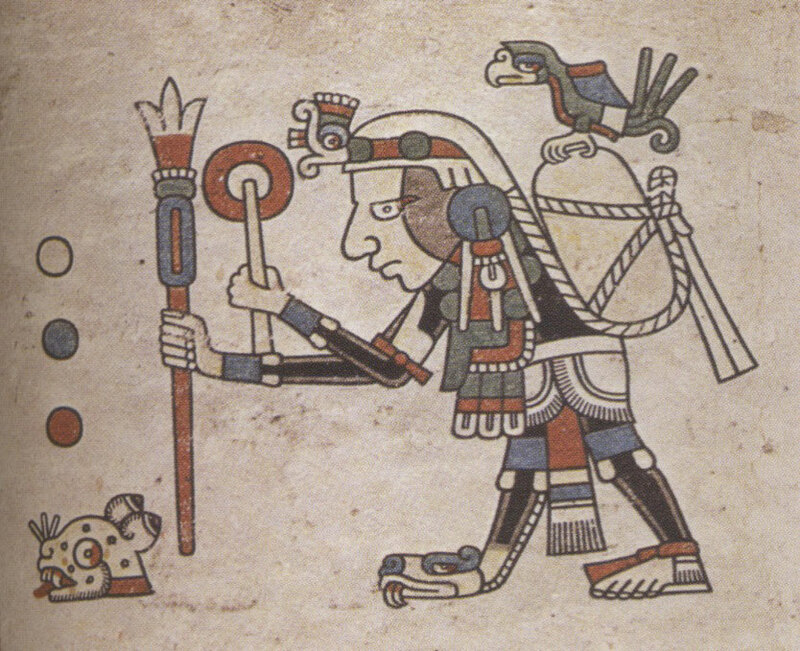 Not one manuscript yet found from the first half of the sixteenth century, whether in Nahuatl or in Spanish, uses the word “chocolatl.” Both at that time and even continuing forward, manuscripts are far more likely to mention the term cacahuatl (cacao + atl, Nahuatl for water/liquid). Scholars Michael Swanton and Bas van Doesburg, both now of Oaxaca, have conducted detailed research into the earliest manuscript references to cacao. If you understand Spanish, you can watch this 14-minute video of a recent lecture about the subject: El Origen de la Palabra Chocolate. But one of the main points van Doesburg makes is that the term chocolatl (or chocolate in Spanish) does not become common until after 1590. It moves from Guatemala and Chiapas into central Mexico in the 1590s. He also notes how the Spanish colonizers encouraged the spread of chocolate production beyond its prehispanic limits, and they began consuming it along with the indigenous people. It becomes clear that what was once a cold cacao beverage, in prehispanic times, came to be a hot beverage under Spanish influences, and that is when the term chocolate appears. We can ask van Doesburg and Swanton what they have discovered since that 2010 presentation of the video. Be watching especially for comments they will make about research into terminology related to the frothing of the beverage. The fruit-bearing cacao tree is native to Mesoamerica. 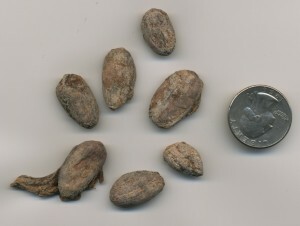 Each pod typically contains 25-40 seeds. Both the pulp and seeds are edible. The pulp is sweet while the seeds are bitter. Here’s an Ancient Cacao Map, made at the archaeology lab at the University of British Columbia in Vancouver. The site includes an interactive online database which collects information about ancient cacao samples found in archaeological sites and beyond. One can trace products as they go from the Western Hemisphere across the Atlantic and vice-versa; what is now called the Columbian Exchange, thanks to the coining of the term by Al Crosby (on the faculty of UT Austin) in 1972. Here’s a summary of the concept by Al himself. To look more closely at the export of chocolate to Europe, take a look at this article about chocolate kitchens in London. As with most fruit, cacao pods are judged ripe or unripe by their color. 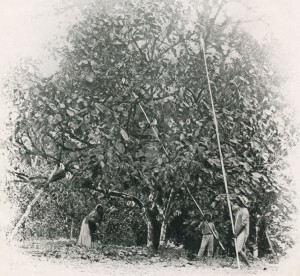 When the grower has decided to harvest, the first round of pods are cut off the tree with a sharp blade that is either hand-held or attached to a large pole for distance. This process is usually repeated three times in intervals of three weeks or longer, because not all pods ripen at the same rate and crop uniformity is important for efficient processing. Once picked, the pods are taken to the location where fermentation will take place. It is important that the seeds stay in the pods to insure uniform condition upon their arrival for fermentation. It is then that the seeds must be removed from the pod. Depending on the tradition or location a machete, wooden mallet, or cutlass is used to open the pod. The wet beans are then removed from the pulp by hand or knife. Each of these methods employs sunlight as a heat source. The beans are meant to lose their moisture slowly without roasting in a process comparable to sitting in a sauna. The moisture is drained and the beans are mixed so air exposure is uniform and molding is prevented. Also in this step of the process the bean finally dies. This eliminates its possibility to germinate or sprout. The fermentation takes about three days. Once cured, the cacao beans have reached maximum flavor potential and are laid out to dry completely. Once dry, they are ready to use or trade. 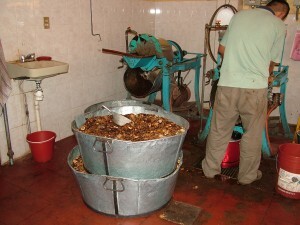 The dried beans are removed from their thin husks (similar to the papery shell around a peanut), and then they are ground on a metate until a smooth paste is achieved. 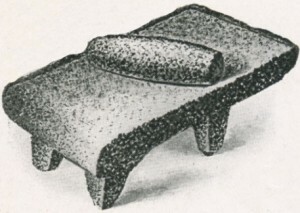 A mano (hand piece) and metate (platform for grinding). 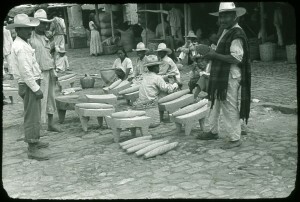 The metate (Spanish for the stone slab platform, above, which comes from the Nahuatl term, metlatl), was used for grinding cacao beans, corn kernels, seeds, and even the bugs that are ground for the cochineal dye. The metate (and mano, hand piece) has prehispanic origins and yet it is still found throughout Mesoamerica today. Metates for sale somewhere in the state of Oaxaca, ca. 1930s or 1940s. Slide in the WHP collections. 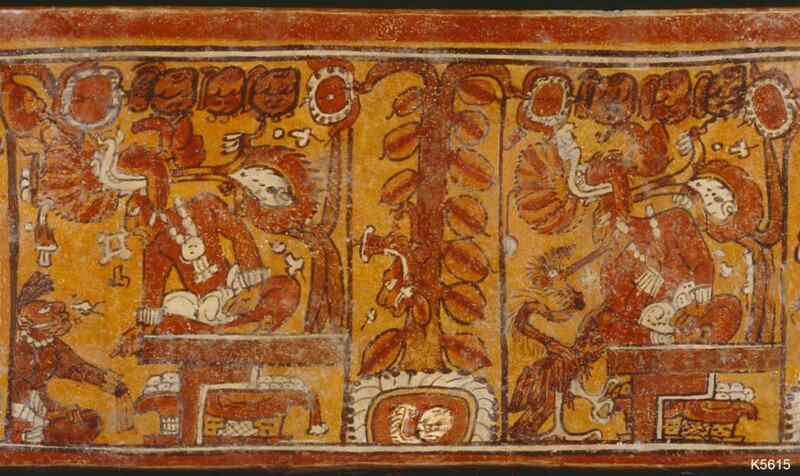 An image from a Classic-period Maya vase shows a cacao tree, and below it we see a person using a mano and metate to make a cocoa powder or paste. We have permission to use any of Justin Kerr’s photos of Maya vases. If you go to his database search page, you can search cacao and other terms and get many results. This resulting paste made from ground cacao beans is pure chocolate. This paste can be immediately used or can be shaped into tablets for later use. This was a popular option for ancient preparations on a batch-by-batch basis. 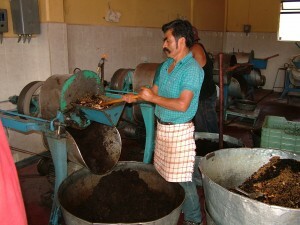 It was more common in the Spanish colonial period for ground cacao to be mixed with other ingredients. It may have originated as a cold beverage, but was clearly drunk hot by the late sixteenth century (see van Doesburg video, above). Chocolate also increasingly became an ingredient not only in beverages but also in sauces, such as what is now called mole (from molli, Nahuatl for sauce). 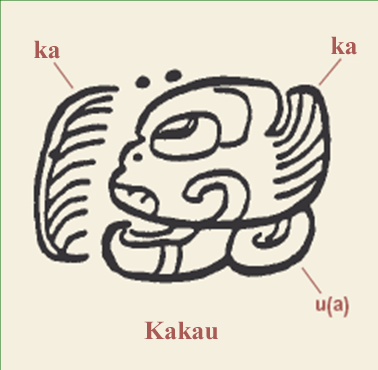 Note how the Maya word, “kakaw” (spelled phonetically), is the same word we know today, cacao. The English word “cocoa” is a distortion of cacao. A full-text essay by Kerry Hull about Maya foodstuffs, including cacao, might be of interest. It is available from Academia.edu to members (and membership is free). 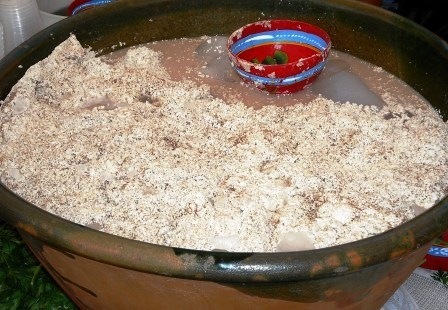 Mesoamerican preparations of chocolate often called for the frothing of the drink. The foam created in the process is especially sweet and is highly sought after. The chocolate is traditionally frothed by by pouring the drink from pitcher-to-pitcher from a distance (a pre-Columbian method) or agitating the liquid with carved wooden mollinets (a European introduction). The older process is pictured below. 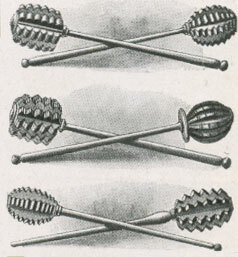 “Molinets” (an Anglicization of the French; in Spanish: molinillos, little mills) were introduced by Europeans for frothing chocolate in small quantities. Raising a froth is also a desired result for other beverages, such as tejate (still popular in Oaxaca) today, pictured below. In this video of Oaxacan cuisine, at about the 14th minute, we see a woman making coconut-flavored tejate, pouring the water in from a height in order to increase the foam. The next time you have a frothy latte, think about how enjoyable froth can be. 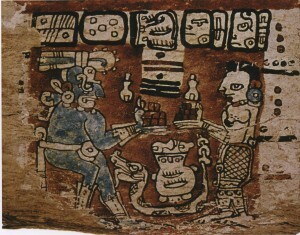 Chocolate beverages were consumed primarily by Mesoamerican elite families, perhaps because cacao was not obtained easily, at least originally. 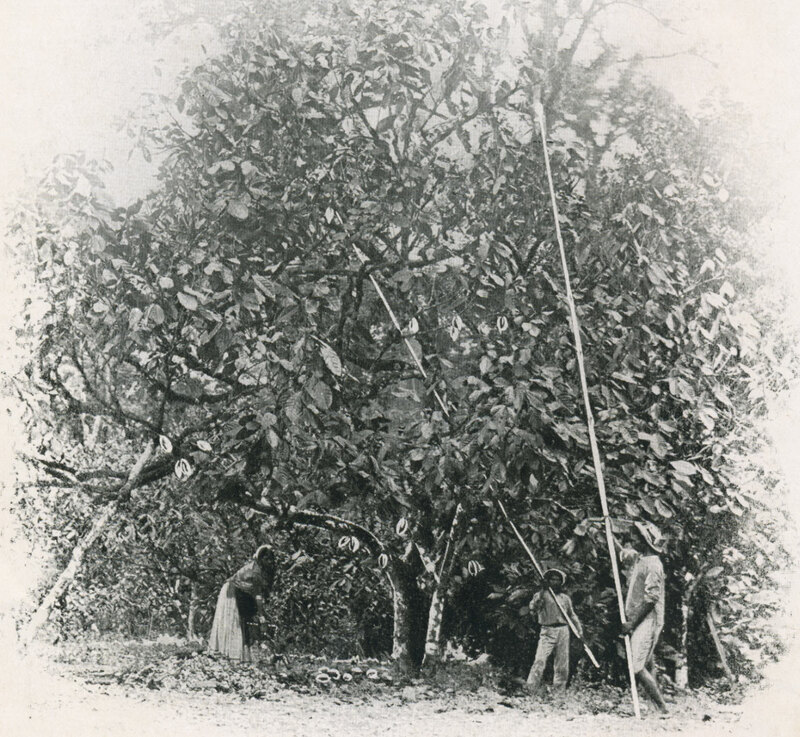 Certain climatic conditions were required to grow cacao, such as those found in what is now Guatemala, Soconusco (a Pacific coastal region in the Mexican state of Chiapas), a small part of the Mexican state of Tabasco, and a small area of Honduras. The Nahuas of central Mexico obtained cacao through trade and through conquest, followed by the demand for cacao as a tribute item. Foot-merchants (the pochteca class) traveled great distances to bring cacao to central Mexico. But cacao also made its way into what is now the U.S. Southwest, where residues have been found in pre-Columbian pots. 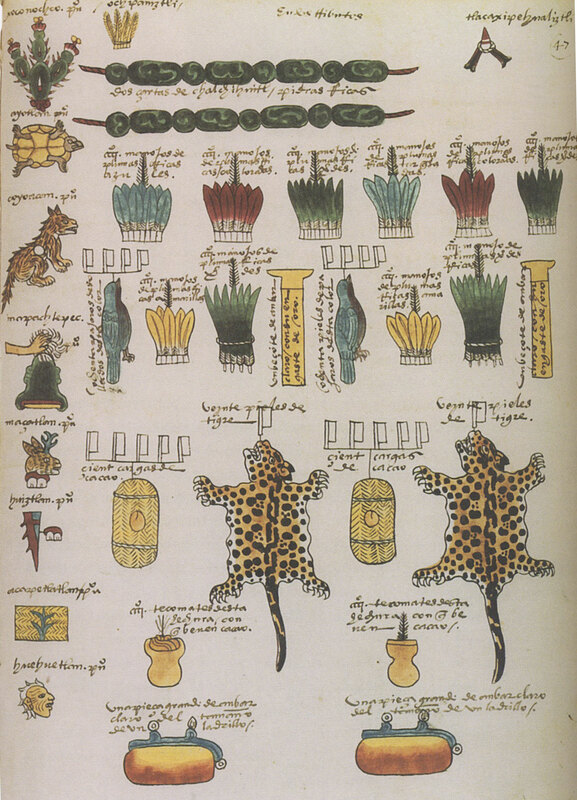 Below is a page that was illustrated by an Aztec artist for Antonio de Mendoza, the first Spanish viceroy of Mexico. It depicts the tribute items of high value that the Aztec empire exacted from subjugated communities. Here we see cacao, honey, cotton, feathers, animal pelts, jade beads, and gold. On this page we see two bundles of cacao beans (wrapped in woven mats). Each bundle has five flags on top, and each flag represents the number 20. Therefore, we are seeing references to two lots of 100 bundles of cacao seeds. 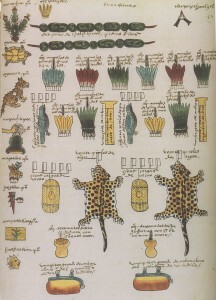 Page from the Codex Mendoza or Matrícula de Tributos. Cacao was so valued that archeological digs have discovered collections of counterfeit beans. This was the early equivalent of a modern day criminal printing fake money. The Popol Vuh (Quiché Maya book of creation) suggests that cacao was one of the few ingredients used to create human beings. 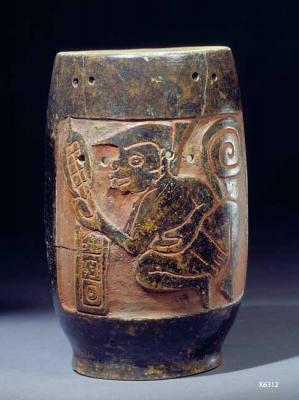 (Dreiss-Greenhill 18) On a Classic-Period Maya vase (below) we see that the head of Hun Hunapuhu, a figure in the creation story, was put on a cacao tree. Click to enlarge the image or follow this link to Justin Kerr’s Mayavase Database. From the entry search page, one can enter cacao and find other interesting examples. In this image of the cacao pod (above) we can see how similar the arrangement of the beans in the pod are to the kernels of corn on a cob. Grofe mentions this similarity in his article (page 4), where he discusses the close relationship between cacao and maize for the Classic Maya. They may have had the same patron deity. In some Mesoamerican cultures, trees are a metaphor for spiritual transcendence. From their roots to their canopy, they represent a connection between the underworld, the physical world, and the heavens. In Maya cosmology, all of creation came from a “World Tree” or “First Tree.” Depending on the region, sometimes this “First Tree” was a cacao tree. (Dreiss-Greenhill 22) At the Mayan city of Copan, depictions of cacao pods grow from the trunk of the axis mundi (World Tree or Cross), which distinguishes it as a cacao tree. 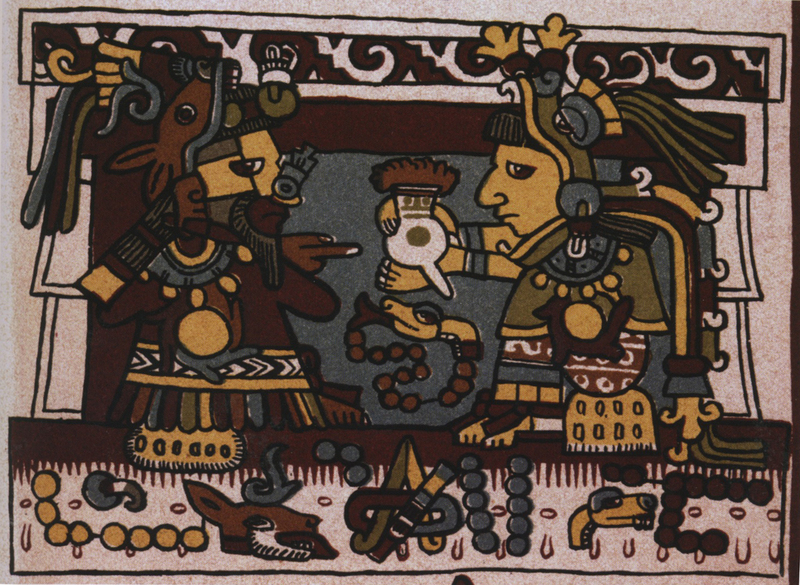 The Mixtec marriage of Lord Eight Deer and Lady Thirteen Serpent, who exchange a cup of chocolate. 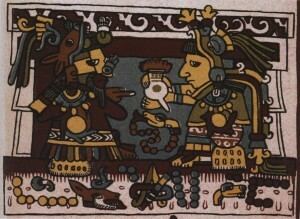 The Maya rain god Chac and the moon goddess IxChel exchange cacao. Cacao was generally viewed as the cosmic opposite to its partner food staple, maize. Maize had a symbolic relationship to life and cacao to death. The former grows in the sun while the latter requires shade. Its ritual importance even existed in the most sacred of ceremonies; human sacrifice. 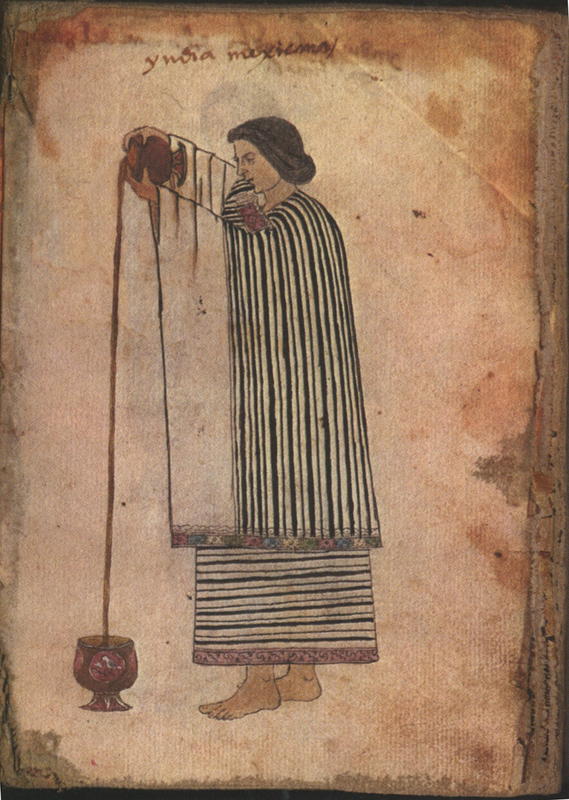 We learn that “the people of Cholula, Mexico, made a cacao beverage using water in which the knives used in human sacrifice had been washed…,” and, in the Florentine Codex, Sahagún recorded that “‘heart’ and ‘blood’ were metaphors for cacao.” Both the heart and the cacao pod served as containers of divine fluid; blood and chocolate. It has even been suggested that cacao exchange between intermarrying families represented the mixing of the bloodlines. (McNeil 15) The cacao pod also resembles a human heart and is about the same size. 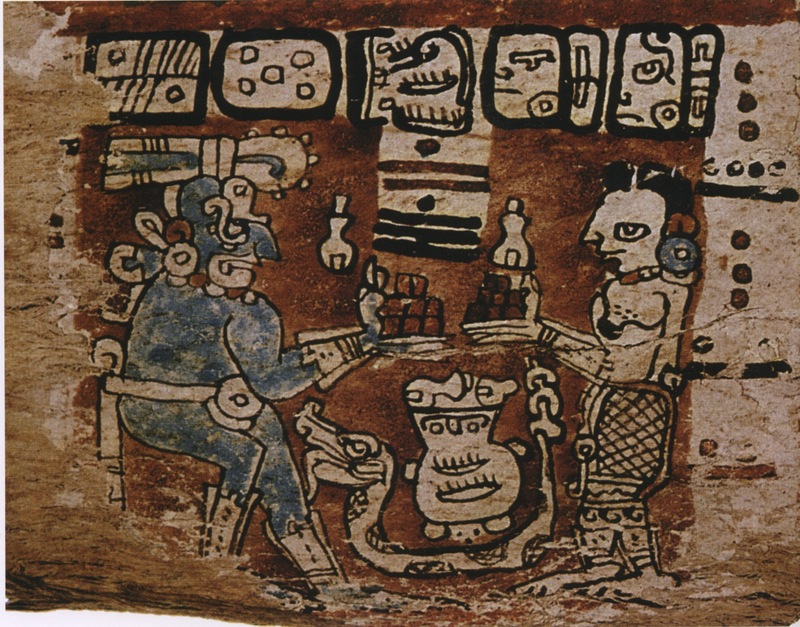 In pre-Columbian Mesoamerica, to possess cacao was evidence of affluence and prosperity. Early accounts record mixed reports of exactly who was able or allowed to drink cacao, but the most reliable estimate is that only those in power or those with expendable wealth drank the beverage. 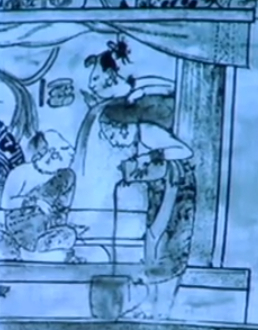 Sahagún reports, “If he who drank it were a common person, it was taken as a bad omen. And in times past only the ruler drank it, or a great warrior, or a commanding general…if perhaps two or three lived in wealth they drank it. Also it was hard to come by; they drank a limited amount of cacao for it was not drunk unthinkingly. (Florentine Codex, Book 6). 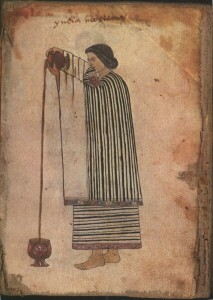 Another 16th century account from Diego Garcia de Palacio regarding the Pipil natives in El Salvador writes, “the beverage in which they prepare from cacao was formerly so highly esteemed by the Indians, that no one was permitted to drink of it, unless he were a great personage, a cazique, or a famous warrior” (McNiel 18). Chocolate beverages captured the attention of Spanish invaders right away. Spaniards would take chocolate back to Europe with them, and from there it would eventually circle the globe and become an object of mass consumption. This is a video published by the Huffington Post, just over 4 minutes, that discusses the decline in the production of cacao for making chocolate. It has wonderful scenes of a woman in her cacao forest, close-ups of the seed pods, and images of the roasting of the cacao beans. In Spanish with English subtitles. While in Oaxaca city, consider taking a visit to Mina street to see (and smell) the wonderful chocolate mills, where customers bring an ingredient list, and workers make special recipes to order. One can specify how much cacao, cinnamon, vanilla, sugar, and so on. The Field Museum of Chicago has developed a website, “All About Chocolate,” with information about the history and production of chocolate. The site includes downloadable teaching resources and more. University of Texas, Outreach World, “Chocolate: From New World Currency to Global Addiction,” 27–44 of a larger curricular unit. High School. “Fair Trade in the Classroom,” includes a close look at the production of chocolate. “Chocolate Food,” International Primary Curriculum (for ages 8–9) — much used and variously revised, you may find some criticisms of this curriculum, but it might also provide some ideas. “Themes for Chocolate as a Cross-Curricular Theme” (prepared in the United Kingdom). Caroline Seawright, “Life, Death, and Chocolate in Mesoamerica,” 2012. Castillo, Bernal Diaz. The History of the Conquest of New Spain. Ed. David Carrasco. Albuquerque, NM: University of New Mexico Press, 2008. Coe, Sophie D. America’s First Cuisines. Austin TX: University of Texas Press, 1994. Dreiss, Meredith L. and Greenhill, Sharon E. Chocolate: Pathway to the Gods. Tucson, AZ: The University of Arizona Press, 2008. 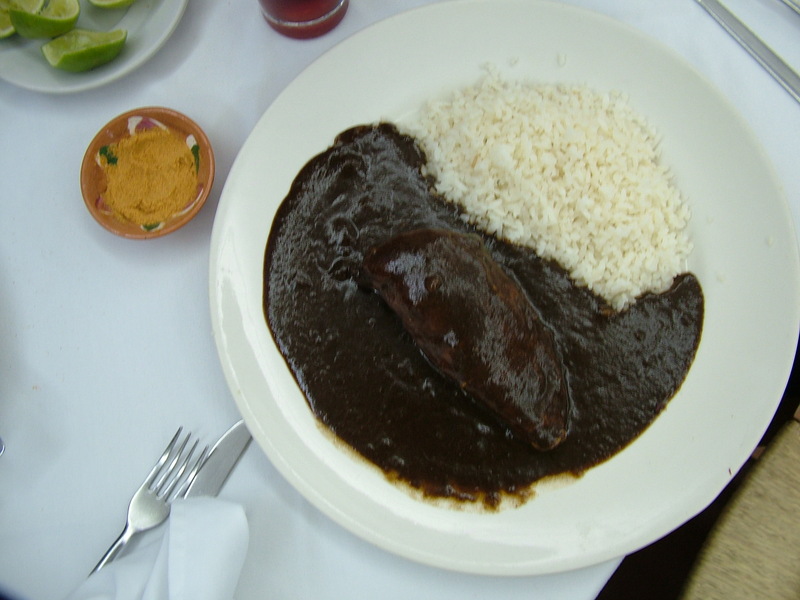 McNeil, Cameron L. Chocolate in Mesoamerica. Gainesville, FL: University Press of Florida, 2006. Rohan, T.A. Processing of Raw Cocoa for the Market. Rome: Food and Agriculture Organization of the United Nations, 1963. West, John A. 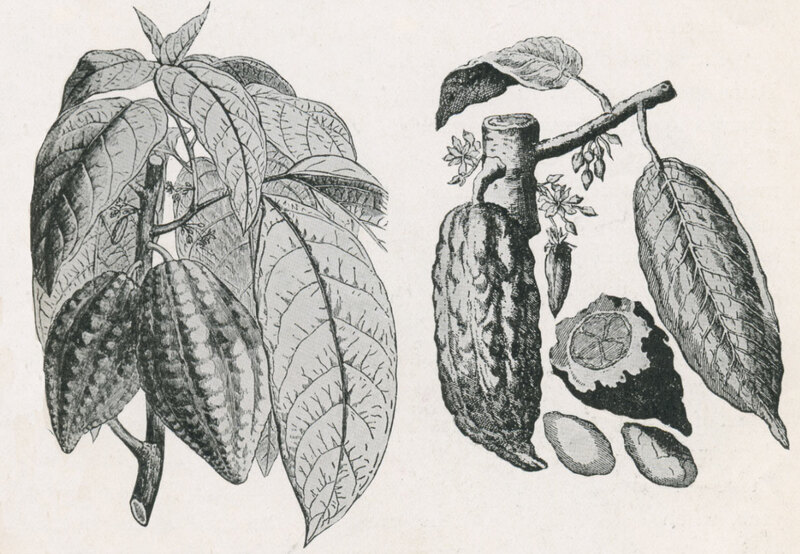 “A Brief History and Botany of Cacao.” Chilies to Chocolate: Food the Americas Gave the World. Ed. Nelson Foster, and Linda S. Cordell. Tucson, AZ: The University of Arizona Press, 1992. Walter Baker & Co. Limited. 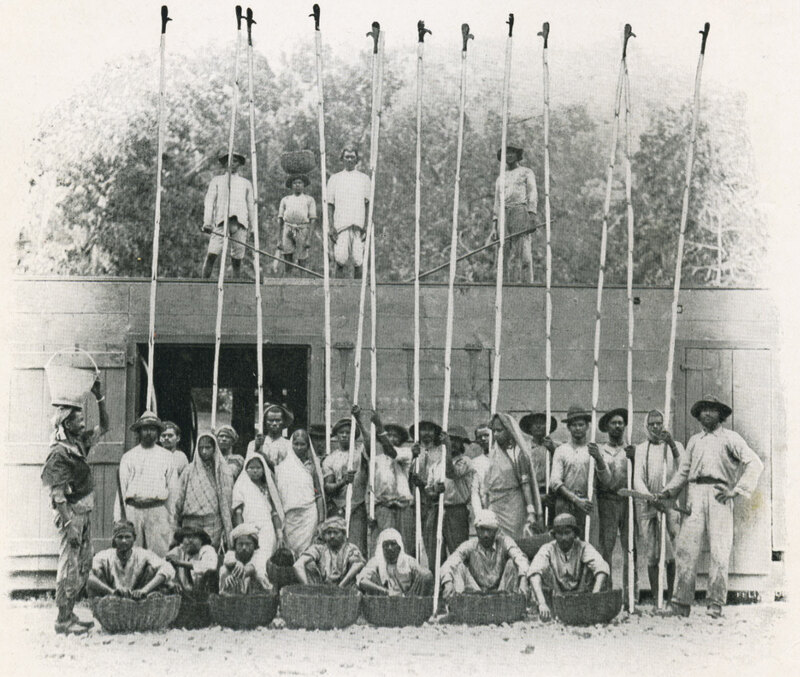 Cacao and Chocolate: A Short History of Their Production and Use. Dorchester, Mass: The Barta Press, 1917. Whymper, R. Cacao and Chocolate: Their Chemistry and Manufacture. Philadelphia, PN: P. Blakiston’s Son & Co., 1912. Gage, Thomas. “Writings on Chocolate.” Thomas Gage’s Travels in the New World. Ed. E.S. Thompson. Norman, OK: University of Oklahoma Press, 1958. Assembled by Andrew Gunsul, Spring 2010, University of Oregon. With some subsequent edits by Stephanie Wood.